Isn’t it amazing how a few days of glorious (in our case) sunshine and slightly warmer temperatures can improve your mood? Even with BigR waking up before 5am hasn’t dented my mood. I’m embracing the start of spring. We had a lovely family weekend walking, eating out, a trip to town for a birthday present, playing in the garden, a birthday party and enjoying our new coffee machine (the caffeine addiction runs deep). Even being at work today, in the bit of my job that has the hellish commute, I’m finding beautiful things, such as the view above. I’m looking forward to a random day off tomorrow that the ABO and I plan to spend together probably without the girls for a change. A little bit of time off for us all. It's amazing how blue sky can lift our mood in an instant. I'm hoping we have left the rain and wind behind. 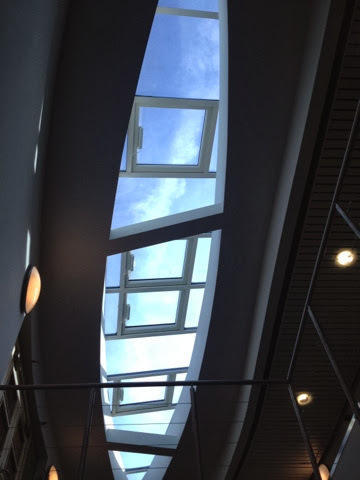 That's quite a skylight in your picture. Is it a library roof? I'm so glad the weather has improved and that you could get out and enjoy it. I know that wide-awake-and-worrying feeling only too well! I hope you've slept better since then. Hope you enjoyed your day off and that it was restorative and didn't go by too quickly (as days off tend to do). When I was studying I had terrible anxiety dreams that I'd forgotten to turn up to an exam or had missed an important meeting. I used to keep a notebook by my bed to write it down so I could check the next day....maybe I should do that again?!
" I need not to worry about things when there’s nothing I can do anything about it"
Yes...perhaps if I find the magic answer I'll be able to spread the word!! It's still good to know you;re not the only one even if it does feel that way at 3am :)!